Andrea Bauer The house-cured sardines are accompanied by crunchy shreds of pumpernickel bread and garnished with horseradish cream, dill, and celery leaf. 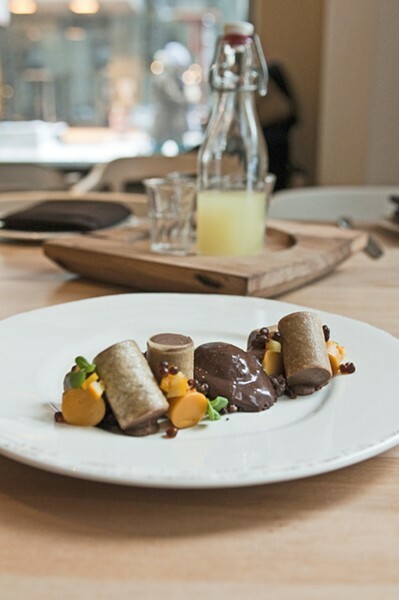 Andrea Bauer Gianduja-stuffed cannoli is planted among spherified balsamic vinegar pearls, candied blood orange zest, and cylinders of mild sweet-potato flan. 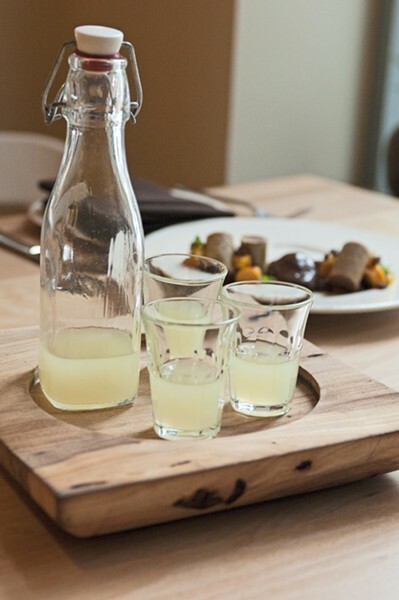 Andrea Bauer Diners are bid farewell with a complimentary glass of house-made limoncello. In the early 60s the ailing Italian countess Amalia Mani Mocenigo was ordered by her doctor to adopt a diet we might today label Paleolithic. In short, she wasn't to eat cooked meat. So while she was visiting the legendary Harry's Bar in Venice, proprietor Giuseppe Cipriani did what any resourceful, self-respecting member of the hospitality industry does when confronted with a seemingly wacky dietary restriction. He presented her with a plate of raw, tissue-thin lean prime beef, sprinkled with salt and drizzled with mustard and Worcestershire-spiked mayonnaise. So was born carpaccio, named for the Renaissance painter Vittore Carpaccio, whose vivid reds and whites reminded Cipriani of raw beef. In subsequent decades the dish has undergone as many mutations as the dry martini popularized (but not invented) at Harry's—some worthy, many others carpaccio in name only, featuring other kinds of meat, vegetables, or fish. Michael Sheerin has a carpaccio on the menu at Cicchetti, the new Venetian-inspired restaurant where he resurfaced after mysteriously disappearing from Trenchermen last summer. The move was, at first, a head scratcher. How would Sheerin—who brought to Blackbird a modernist approach developed in New York kitchens like WD-50—handle this very particular, time-honored regional Italian cuisine? Well, if his carpaccio is any indication, he's both honored it and updated it, decorating the deep red minerality of aged hanger steak with dabs of raisin-caper aioli and shreds of crunchy dehydrated cauliflower. The dish is among the menu's 13 antipasti and cicchetti, the little snacks served like Spanish tapas or Basque pintxos in bars known as bacari. But anyone expecting anything like a typical Venetian bar scene in Streeterville will be disappointed. Sure, there's a bar on the street-level corner of Northwestern Hospital's Galter Pavilion, with plenty of room for snacking and imbibing from the list of 20-odd classic and Italian-inspired cocktails, such as a sparkling but potent refresher known as the Stiletto, made with Piedmontese Brachetto d'Acqui red wine and sweet vermouth and given body and depth with the addition of three kinds of bitters. 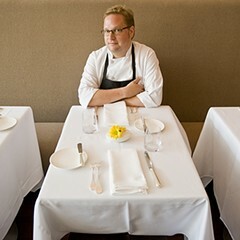 But there's also an adjoining dining room that in turn leads to an outpost of the fast-casual Italian cafeteria Sopraffina Marketcaffe, a minichain that shares with Cicchetti a mutual owner in Dan Rosenthal, who's built a small empire of green-certified restaurants that includes Trattoria No. 10 and Poag Mahone's. It's an odd juxtaposition, and it raises the question of whether the captive population of medical tourists and medical professionals who depend on places like Sopraffina (and the Corner Bakery across the street) just to get through the day can handle the mind-bending temerity of Sheerin's food. 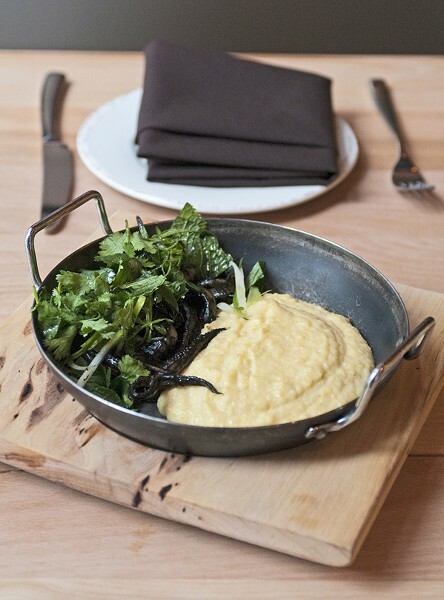 I'm talking about a visually arresting bowl of creamy, cheesy yellow polenta set like a crescent moon against a tangle of tender squid tentacles blackened by their own ink, seasoned with lime, chile, and black garlic, and garnished with cilantro, a classic Venetian dish sent through a wormhole to Thailand. 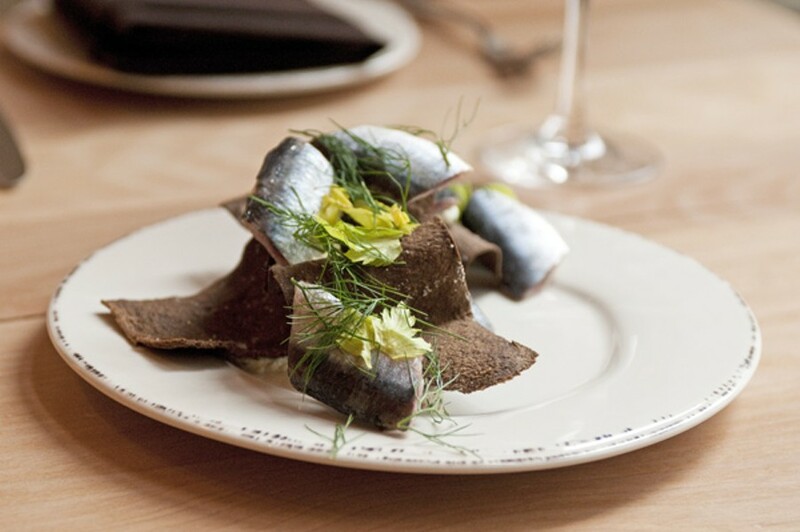 Then there's the house-cured sardines, briny, sweet, meaty fillets nodding to another Venetian standard, pesce in saor, but accompanied by crunchy shreds of pumpernickel bread rolled through the pasta maker and garnished with horseradish cream, dill, and celery leaf, like something plucked from the Nordic playbook. Some things seem provocatively un-Italian. I don't know if Venice shares Chicago's love of deep-fried pork fat, but Cicchetti's cracklings are light, white, and puffy, coiled like funnel cakes and dressed in Parmesan and rosemary to taste like the finest Cheetos you've ever had. I would never blink at Iowa's excellent La Quercia prosciutto paired with baby arugula, but the hidden chunks of roasted sweet potato and nutty pumpkin-seed salsa verde had my eyelids fluttering. An assortment of bruschetta—topped with creamy, rich duck liver paté sprinkled with cocoa nibs, slabs of fatty pork belly brightened with fennel and sweet-and-sour golden raisins, and oil-poached tuna and pickled shallots—presents three inspired combinations of sweet and savory using ingredients you'd expect to find in a high-end brewpub before an Italian restaurant. More-straightforward plates are given appealing tweaks also. Loosely formed pork meatballs in red sauce loaded with chunks of pancetta made a controversial plate at my table due to a strong clove-y flavor that I loved (everyone else disagreed). 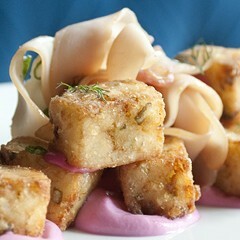 A selection of three cracker-thin flatbreads includes a number with parsley, pancetta, and pickled red onion, blanketed in a gooey-good aged provolone that's funkier than the underside of a gondola. So far I've only brought up the cicchetti, and on my visits I was so helplessly greedy in ordering them that I found myself experiencing salt fatigue by the time I hit the larger dishes. 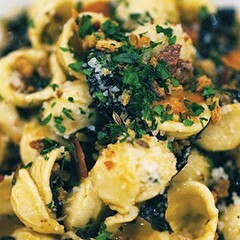 A soup course that arrives in a spoon cradling a single egg-stuffed agnolotti bathes in a double salt whammy of Parmesan-infused broth and shaved guanciale. (Don't be tempted to gild this lily with the optional shaved black truffle—it's plenty powerful on its own.) But less immoderate eaters than I should be happy with plates like a sunburst-colored saffron risotto with a perfectly circular sunny-side up egg as a centerpiece, or chewy, black squid-ink orecchiette tossed with brussels sprouts and a red sauce chunky with lamb soppressata. I caught the kitchen steering toward Scandanavia again with a plate of dense gnocchi and braised pork dressed with sliced pears and celery root in a creamy buttermilk and dill sauce. 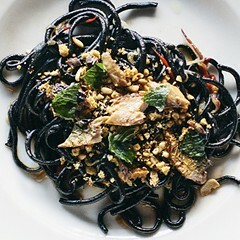 Dishes like that have me wondering if Sheerin really wants to spend all his time in Venice. If true, that's fine with me, because nearly everything I tried at Cicchetti—from a breakfastlike hash of sliced duck confit, breast, and dense Chinese-style sausage with roasted potatoes and onions to a large seafood stew with piquillo peppers and fregola that recalled southern Italy more than northern—was some new and delicious reinterpretation of something familiar, at once comforting and thrilling. 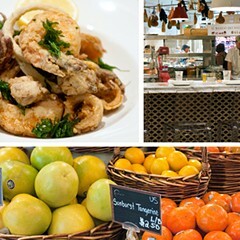 For whatever reason, with the opening of nearby Nico Osteria and Eataly just a few blocks away, this part of the city has become a locus for new and ambitious Italian food. But I venture to say Sheerin—who seems possessed of the audacity of Giuseppe Cipriani—has created the most daring, forward-looking menu of all of them. 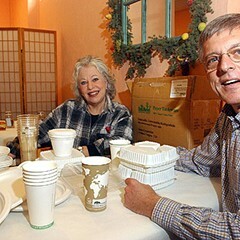 Local restaurateurs put their heads together to make takeout eco-friendly.